Which came first... the chicken or the egg? I suppose a Hamilton corollary might be which came first, production models or awards models? Typically I would have said regular production models came first. The Awards Division seemed to create variants of regular production models that had been discontinued. Organizations that purchased awards watches typically didn't want the recipients to find their award in their local jewelry store. Awards Division watches are easy to spot because they often say "Masterpiece" on the dial. A good example for consideration is the 1958 Courtney. It was produced for three years and was shown in the catalogs from 1958 through 1961. In February of 2016 I restored a Courtney with a presentation from 1969. 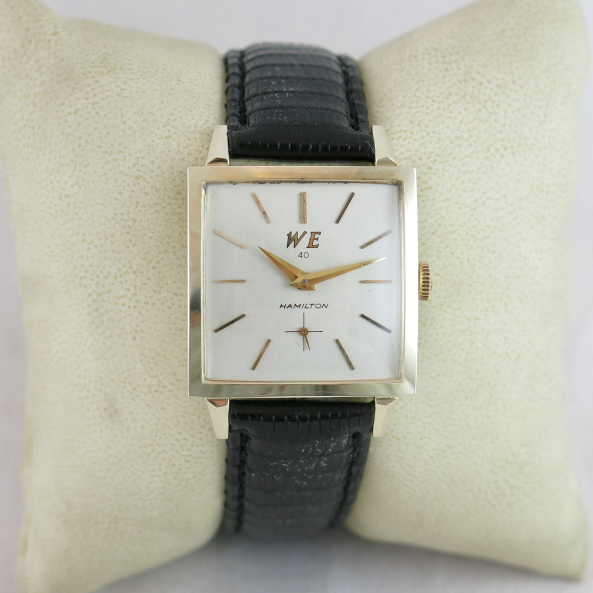 It was definitely an Awards Division watch, as it was engraved with a presentation and had "WE" on the dial, representing Western Electric. I recently had someone contact me about a very similar, but different, watch. Check it out below... sure looks like a Courtney... doesn't it? This one is a bit different though because it has a presentation from 1971 and it doesn't have a 770 movement inside. Notice the second hand has fallen off. It is floating around inside and is on the right between the 3 and 4 markers. 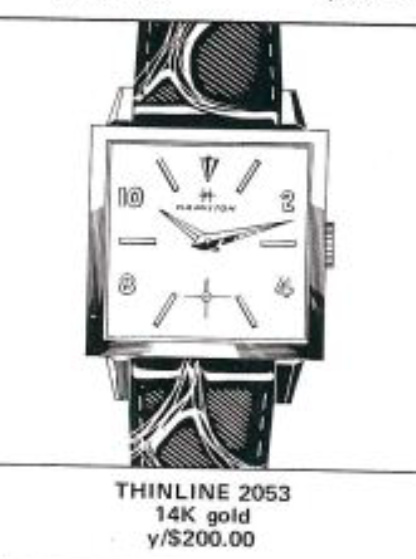 Looking closely at the catalogs, the first time this watch shows up is in 1974, identified as the Thinline 2053. 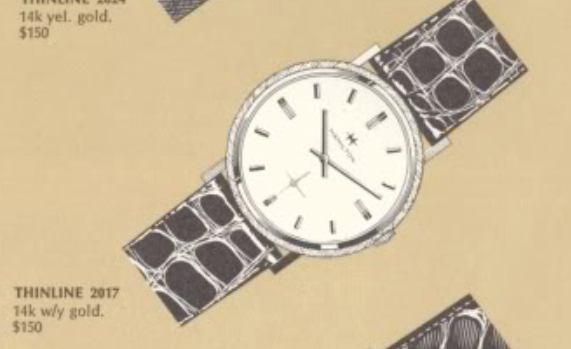 However the dial in the catalogs is a little different (and looks like a Courtney). So how did my project watch come before a cataloged model? Did the chicken come before the egg? By Coincidence my project watch is also a Western Electric presentation with a classic Awards Division engraving. Notice, however, the model number on the case back... 913470. That would indicate that this is a 1970 model. Looking at the inside of the case back, it's clearly not designed for a 12/0 size 770 movement. There are three or four watch makers' marks inside so this watch has been fairly well taken care of. Under the dial is a 17 jewel Swiss-made 637 movement made by Buren. By 1970 production of movements in the US was over and only Swiss-made grades were used in Hamilton models. Taking a closer look at the dial you can see that it has clearly been refinished at some point. First, check out the gloppy-looking H logo... that's clearly not original. I wonder if this dial used to have a WE on it? Also, there's a notch on the top of the dial above the 12 marker. Notice also that the word SWISS is missing from under the 6 position. Lastly, the cross hair for the second hand is clearly too large. Those are all obvious signs of being refinished. If that evidence wasn't enough to convince you, then looking at the back of the dial clearly shows scratched-in characters denoting the dial was refinished. With the dial removed, I can see immediately that the set bridge has been broken. The missing piece was not inside the watch so I'm left to assume that the last watchmaker to open this watch didn't bother replacing the part. I happen to have a donor 637 movement. As long as the set bridge is okay then I can simply substitute it. Talk about luck... check out the dial I found when I flipped the movement over. Does it look familiar? It's from a Thinline 2053! It's also an Awards Division dial - as defined by the word "Masterpiece" under the Hamilton logo. If you've got a great eye for detail you might spot it has a marker at the 6 position though - the catalog depiction doesn't show that. My luck continues - the set bridge on this movement is intact. Now you can clearly see the difference between the donor and the broken bridge on the left. The arm that sticks out holds the set lever in position. Everything is cleaned and dried. Time for reassembly. It took a bit of tweaking but I finally dialed in the beat rate and the beat error to very acceptable specs. The second hand is an obvious replacement and is a bit too tight to go onto the 4th wheel bit. I'll need to open the hole just a teensy bit and in order to that I'll need to use a very tiny broach. Since I happened to have the correct dial I decided to turn this awards watch back into a catalog-worthy Thinline 2053. I didn't change the crystal on the watch yet. The current one isn't quite correct but it'll do for now. This is a sharp looking watch and from the outside it would be easy to confuse with the 1958 Courtney but it's actually a 1971 Thinline 2053. Go figure. I purchased a new crystal for the Thinline 2053. I believe it's the same as for the Courtney. The finished watch looks better with a proper-fitting crystal. It's interesting that the dial has a marker below the second hand, like the Courtney, but the dial has SWISS like it would for the Thinline 2053. The catalog depiction for the Thinline 2053 doesn't show a marker though... very odd, isn't it? The last of the mechanical asymmetric models to be introduced was the 1965 Accumatic A-504. It wasn't the last to be produced though - as the Blade and Lord Lancaster Lancaster C continued to be made through 1969. However the A-504 was the last asymmetric model to be introduced and it was only made for a single year. If the A-504 looks familiar it might be because it was based on another one-year-wonder, but from 1959 - the Electric Regulus. In fact, the A-504 used left over Regulus cases but with one major caveat, as you'll see below. 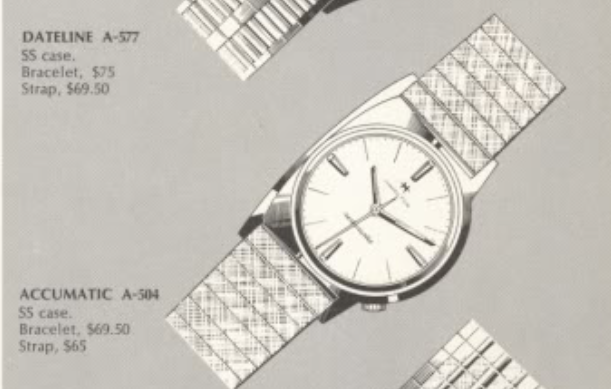 Being a 500-series watch, the A-504 came in a stainless steel case. It's also featured a 17 jewel 689 movement inside. That's an interesting fact as well - in that by 1965 the 689 had been replaced by the 689A movement so I suspect the A-504 was an "inventory eater" and was only made for a single year because it used up excess inventory on hand. That's just a guess though. My A-504 project watch came courtesy of a fellow collector and it was in serious need of help. Obviously it needed a new crystal and a crown. The dial has an odd water spot between the 1 and 2 hour marks. The red-tipped second hand could be a replacement because it doesn't match the catalog depiction but it does look like a Regulus second hand so maybe it's original? The minute hand seems to have a slight bend to the side too. Hopefully I'll be able to straighten it out. Notice the lip on the case back. That leads me to believe this is a two piece case. 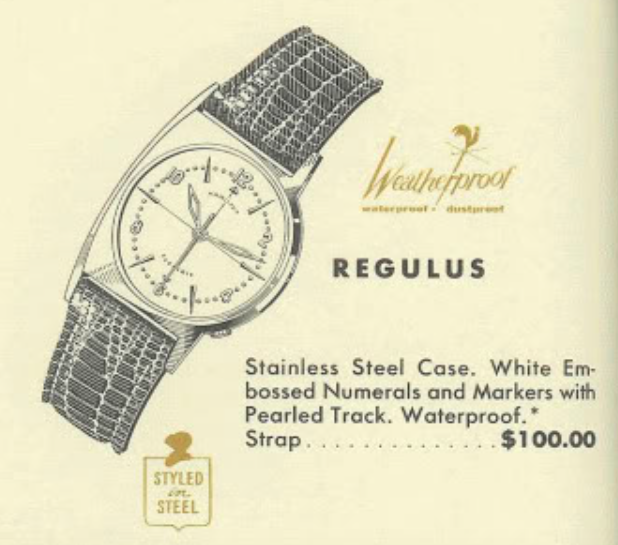 In fact, the Regulus did have a two-piece case along with an odd D-shaped gasket to make it "waterproof". However, by 1965 Hamilton decided that one-piece cases were more water proof so the A-504 case was soldered closed and cannot be opened. Based on the scratch marks on the case back, I don't think I am the first person to thing this to case should open but when I saw it didn't budge, I decided to trust my instincts and open it from the crystal. Sure enough, with the crystal out of the way, the movement lifts right out - especially since there's no crown holding it in place. The 12, 3, 6 and 9 markers on the dial are textured - presumably to match the texture on what would have been on the original matching bracelet. Here's a shot of the 689. Other than a slightly different oscillating weight framework and kif shock jewels, it's identical to the 689A. The inside of the case has a couple of previous watchmaker marks and it looks like the rotor has rubbed a little on the case back. I don't see any signs of a stem in the movement - at least from the front. However the set lever is still there - so that means the watch should be able to retain one when I replace it. One of the dial foot screws is buggered up and cannot be turned. I suspect a past watchmaker put the wrong screw in there and it got jammed in place. The head on the dial foot screws is very small, relative to the bridge screws. Fortunately it wasn't holding the dial so I was able to lift the dial off without issue. Without that screw to secure the dial, the movement won't be properly supported - which is probably why the rotor was dragging on the case back. There's no easy way to get this screw out so I'll replace the main plate instead. I have a donor 689 so that's the easiest path to resolution. From the inside I can see the remnants of the stem. It must have snapped off somewhere to the right of the winding pinion. While everything is being reassembled I'll add new luminous paint to the hands. This movement has the option of a long or short female stem. Since I don't know which one was originally used on this model, I'll try the long version. You can see how much is missing in the shot below. Notice the stamp on the main plate under where the balance will go. This movement is also a calibre 63. The basic movement is put back together and is ticking away with good motion. Not too shabby performance but I can reduce the beat error a little further. There, that's pretty much right on the money now. It will slow a little as it settles in. The stem tube on the case is a little larger than I typically see and will require a crown that will accommodate a stem tube diameter larger than 2mm. In addition to a new crown, I will also need the male portion of the stem called a "hub". There's not much I can do about the dial - it is what it is unless the owner wants to get it refinished. I did not try to clean it since the printing was already a bit faint. However, with a new crystal, new crown and the hands straightened and relumed, this A-504 looks more than presentable. This is a rare watch and very pricey when found "in the wild" so even with a so-so dial it would still be the "pride of the fleet" in anyone's collection.